The Norwegian car transport ship Hoegh Osaka made sensational news January 3, 2015 when it took on a serious list and forced its crew to drive it aground off the Isle of Wight at the start of a trip from Southampton, England, to Germany. 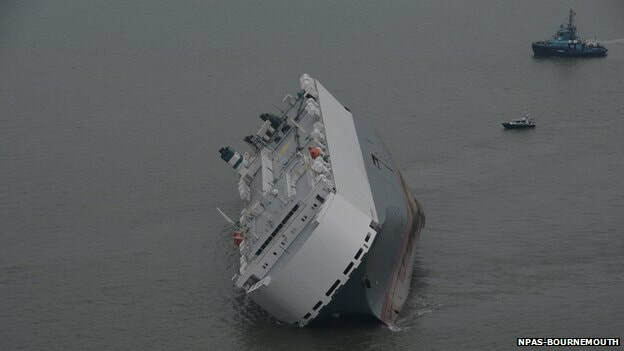 The 590-foot freighter made a spectacular site as it lay almost on its side for four days in the English Channel. The ship was loaded with 1,400 new cars that included 1,200 Jaguars and Land Rovers plus heavy construction equipment. All of the vehicles were strapped down and those that were not flooded were probably salvaged. It was determined that one piece of heavy equipment, an excavator, broke free and punctured a hole in the side of the ship, which caused the vessel to flood. The ship began to list within minutes after leaving port. The list had increased to 52 degrees by the time the ship was driven aground on Bramble Bank. The Hoegh Osaka was close enough to shore that it became an instant tourist attraction. One local restaurant owner said he was doing a land-office business during the time the listing ship was lying off shore. The Svitzer international salvage company’s four tugs brought the vessel safely into Southampton after workers entered the vessel, patched the hole, and pumped out an estimated 3,000 tons of water. The ship slowly righted itself and floated free at high tide on January 7. The list was so severe that workers could not stand inside the tilted ship. They said they strung ropes and used them to hold onto when moving around. The Hoegh Osaka was launched as the Maersk Wind in 2,000. It was sold to Hoegh Autoliners in 2008 for use as an automobile carrier to ports around the world.